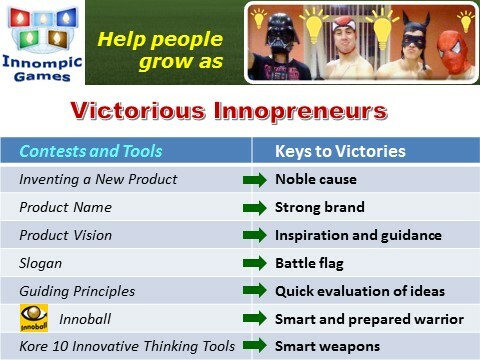 There are Olympic Games for athletes, but the new World needs also intellectual Games for innovators. 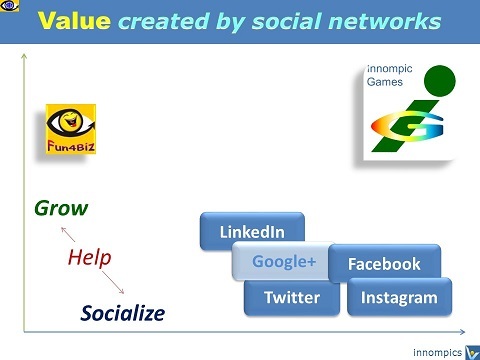 Social networks help people communicate, but people want to grow as well. There are so many talk shows, but the new World needs a Creation Show. There are so many shows for passive spectators, but the New World needs engaging shows for active spectators. There are numerous invention contests, but invention is just the first minute of the innovation thriller. Leading companies build a culture of innovation, but the new connected World needs a global culture for innovation. The are innovation accelerators here and there, but the new globalized World needs a global all-inclusive innovation accelerator. 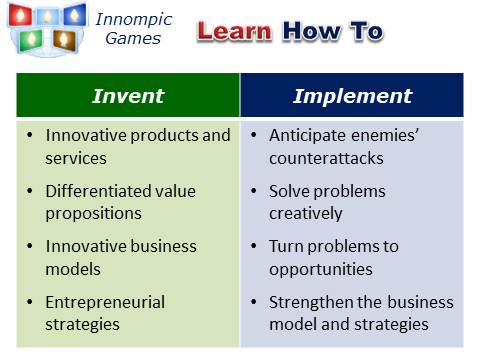 And THE SOLUTION is ... INNOMPIC GAMES! 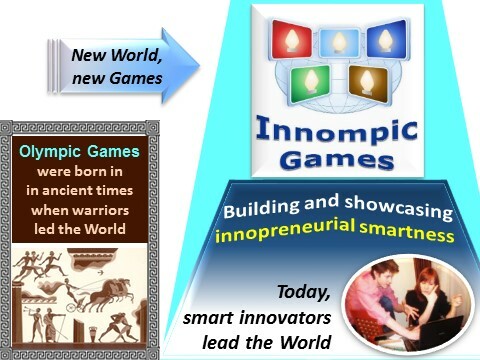 “Teach a man to fish and you feed him for a lifetime”: Innompic Games are to help people around the world – for centuries ahead – to invent new great things and turn their inventions into reality. Web-based entrepreneurial creativity contests will create equal opportunities for rich and poor, men and women, healthy and physically challenged. 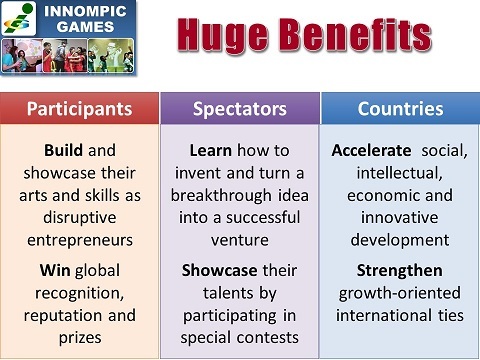 Similar to Olympic games that inspire and stretch people for over 2,000 years, Innompic Games will become the World’s main entrepreneurial creativity contest – inspiring and empowering – for centuries ahead. Olympic Games focus on showcasing physical capabilities. aimed at creation of innovative value for others. 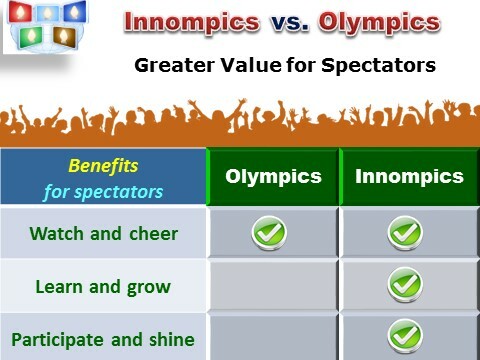 Olympic Games allow millions of spectators watch athletes perform. 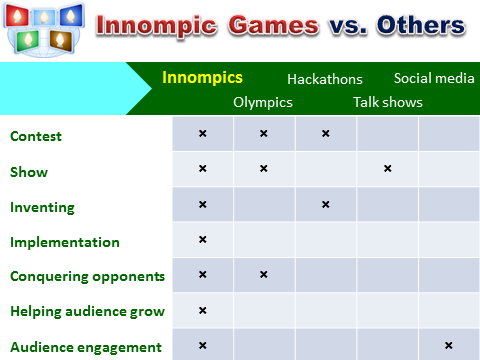 Innompic Games help millions of spectators become “intellectual athletes” by learning from others and participating in various web-based contests. Social networks are “horizontal” – they help millions of people communicate. 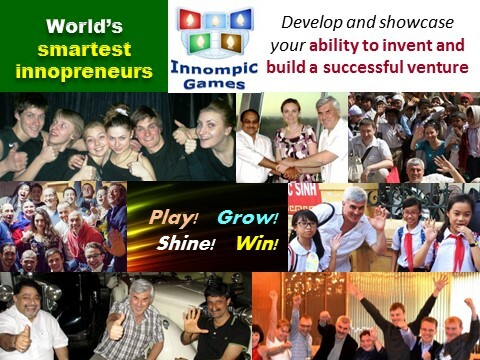 Innompic Games are “vertical” – they help millions of people grow. 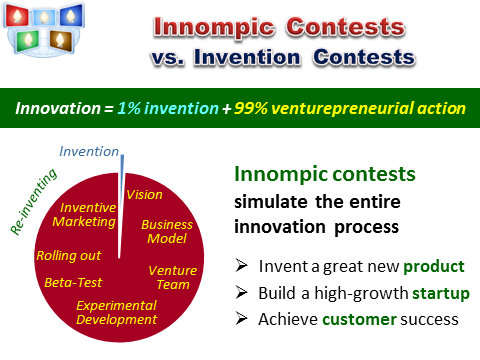 Give innovative entrepreneurs INNOMPIC GAMES, and you'll feed all of them for centuries ahead. of all the participants and spectators all over the World for far better!